The city of Tomsk is the administrative centre of the Tomsk region which is almost 300 square kilometres and is the oldest city in the whole of Siberia and has a population of around 570,000. The city itself is located 3,500 kilometres from Moscow and its surroundings are situated in the south-east portion of the West Siberian Plain on the right bank of the Tom River. 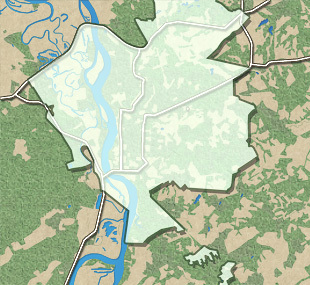 Tomsk also sits on the border of the rugged Taiga Biome, which is the largest Biome in the world. The area the city covers is located on a slightly hilly portion of the West Siberian Plain. The left portion of the city is part of a floodplain area with numerous lakes situated nearby. The right portion consists of picturesque ledges of the Altai Mountain range (30-40 meters high) and Voskresenskaya Mountain which is situated near the mouth of the Ushayka River, a 15-kilometer stretch of the river makes this landscape beautiful and unique. The climate in Tomsk is a continental-cyclonic one (transitional from the European to the Siberian continental, moderately sharply continental). The average annual temperature is +0,9°C and the frost-free period is only 110-120 days long. Winters are usually severe and long, the lowest recorded temperature is -55°C (January 1931) and the highest recorded temperature was +37.7 ° C (July 2004). Natural Resources: outcrops of radon water, explored reserves of kaolin, refractory clay, glass and ilmenite-zircon sands, leucoxene and rutile, bauxite, lignite, zinc, gold, platinum and titanium – are all resources that can be found in Tomsk. The territory of Tomsk includes many green areas, such as parks, gardens, and so on. Most of them are concentrated in the south of Ushaika river. Lagerniy Garden, Siberian Botanical Garden, University Grove, Town Square (Novosobornaya square), Buff-garden, Igumenskiy park, Elizarovikh street park (before the descent on the Baltic Street) are to name but a few. There are also a number of groves in the other parts of the city: Mikhaylovskaya grove, Birch grove in Kashtak, and the Solar Grove at the end of the Irkutskiy tract (north-east of the city). Undoubtedly, Tomsk has an important standing as a cultural centre. It is the oldest major educational, research and innovation centre in Siberia: 9 universities, 15 research institutes, Technology Innovative Special Economic Zone and 6 business incubators. With six theatres, some 20 cinemas and entertainment centres, a planetarium, and about 15 museums, including University’s museums, not every Russian city can boast of so many entertainment establishments. Tomsk is saturated with monuments of stone and wooden architecture of the eighteenth and twentieth centuries. Tomsk is also rich with architectural monuments in the Siberian baroque style, classicism, Art Nouveau, and the most interesting ones – Bourse housing of 1854 and the Governor's House, which was built in 1852. However, the most ancient buildings in the city are religious buildings.